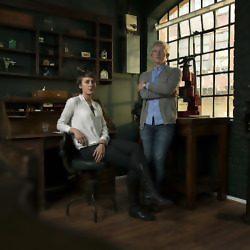 Husband-and-wife partnership, Craig and Rebecca Struthers, are bespoke watchmakers working in the Jewellery Quarter, Birmingham. The couple first trained in vintage and antique restoration before applying their skills to the design and creation of worldwide unique timepieces using heritage techniques. They founded their studio in 2013 and have won multiple wards for their design, craftsmanship and research.